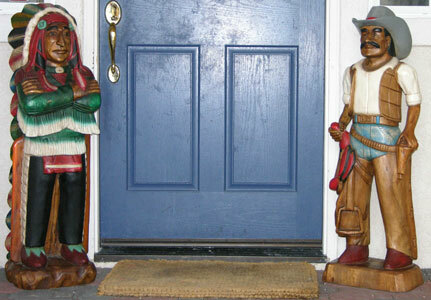 Mexican Cowboy Statue - carved from a single piece of wood this stunning mexican cowboy will add to that Old West feel of your home or office. Handsomely painted and detailed, this is a stunning piece. Since our cowboy statue is artist-made, variations may occur. 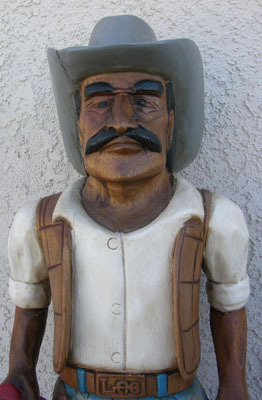 Due to the fact that this cowboy statue is carved from one piece of wood, there may be some cracks (which you can see in the close-up shot), but these only add to the character and Old West look of the piece. The cowboy statue weighs about 35 pounds and stands approximately 39 inches tall. Also available in a 70 inch tall statue. Shipped via UPS or FedEx Ground. Shipping charges are dependent upon your location. We only charge you what it costs us to ship. We do not pad our shipping fees. Reserve your Cowboy Statue today!